FPB 70-1 is shown above between FPB 78-2 and 78-3 (assembly of 70-2 starts shortly, when 78-2 launches). The key to going comfortably upwind, at normal cruising speed, is a bow fine enough to pierce waves, while at the same time with sufficient buoyancy to begin lifting smoothly as larger seas are encountered. And it must be easily steered when surfing at high speed. This is a shaping issue we have been resolving for the past 40 years. 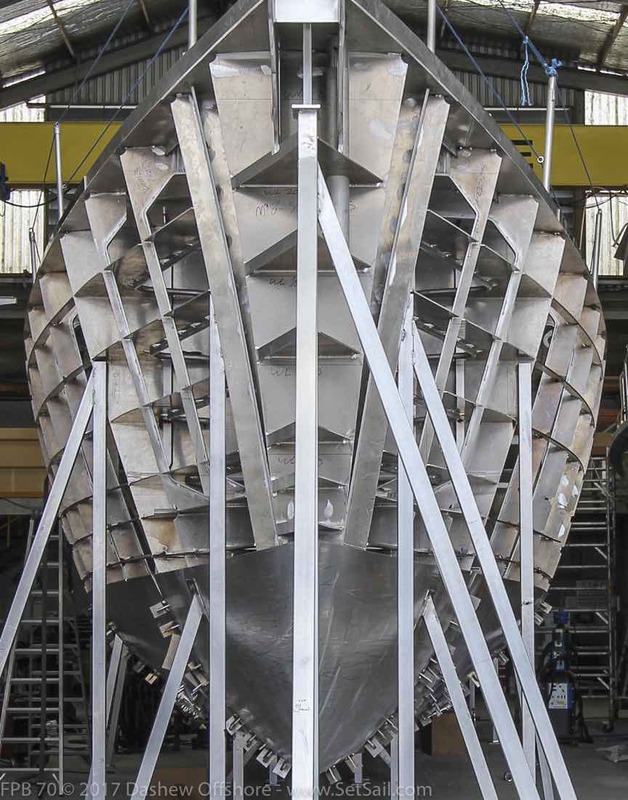 If you look closely, you will see the forward sections off the bow are hollow above the plating edge. What this does is allow the bow to penetrate more easily into small to medium size waves, like those associated with trade winds when your destination is directly upwind. The reserve buoyancy desirable in larger seas comes on further up the topsides. 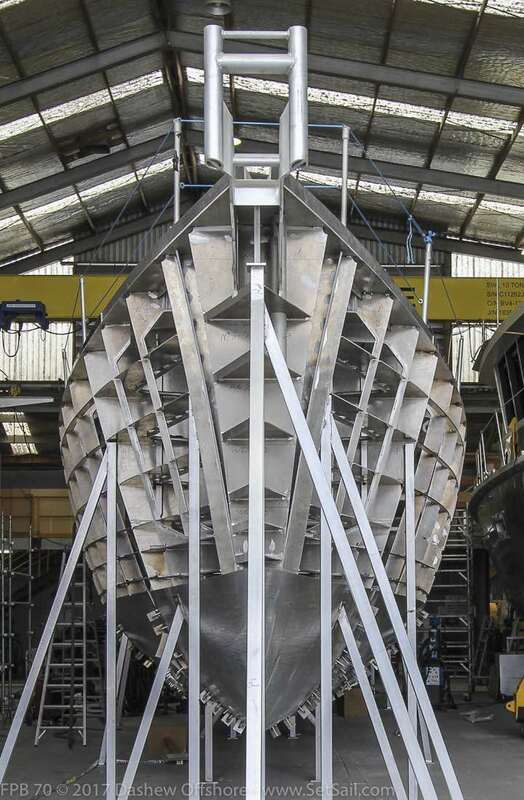 These hollow sections transition to a positive shape at an appropriate distance aft of the bow providing additional buoyancy for larger waves.. Creating this shape with metal, smoothly, was heretofore considered impossible. Of course all of this relates to the stern sections, but that is another story. This entry was posted on Tuesday, January 24th, 2017 at 8:47 am and is filed under Dashew Logs, FPB 70, The Logs, Yacht Design. Both comments and pings are currently closed. It’s a little difficult to tell exactly from the photos, but the forefoot looks fairly deep compared to earlier bows, particularly Windhorse’s. Is the forefoot brought right up to the bow or is it pulled back? How do expect broaching to be affected? The forefoot depth and cross section are related and this plus the slenderness ratio just above the floating waterline is more knife-like than in the past. The closest FPB would be the FPB 78. Rudder size is slightly larger in scale as well. We think steering characteristics will be comparable to other FPBs. Fascinating metalwork, and efficient looking shape. Almost reminds me of airliner wing and wingbox, before they started making those out of plastic that is… Btw very interesting article on bowshapes: “Hiswasymposium 19: The Axe Bow: The Shape of Ships to Come by J.L. Gelling”. Those are some very fine craftsmen who can work that plate over that non compound curve. It is a bow shape that is so totally logical but extremely difficult to plate up. The hours that this will take will be appreciated on every large wave your bows progressively lift out of. The 78s look absolutely huge beside 70-1 assuming sterns are aligned….a significant displacement increase. But when the ground tackle and above decks structure are added there will not be as great a visual difference as in this photo. No doubt, having to deal with large, heavy plate makes it much more difficult.